Jurors were also shown picture inside the courthouse. LETHBRIDGE, Alta. — The father of a man charged with killing three people including a two-year-old girl says his son told him she was in heaven. Derek Saretzky, 24, is on trial in Lethbridge, Alta., on three counts of first-degree murder in the September 2015 deaths of Terry Blanchette, his daughter Hailey Dunbar-Blanchette and Hanne Meketech, who was killed five days earlier. Larry Saretzky sobbed on the witness stand before the jury as he testified against his son, who was sitting just metres away in the prisoner's box. He began crying when asked by the Crown if he had any children. "Yes,'' he said Tuesday, identifying his son in the courtroom. The family owns a dry cleaning business in the Crowsnest Pass of southwestern Alberta. When he and his brother noticed one of the company vans had been moved around the day Blanchette's body was discovered and Hailey was missing, Larry Saretzky said they called police. RCMP were already looking to speak to Derek Saretzky who they had identified as a person of interest. While officers waited nearby, Larry Saretzky said he talked to his son. "I kind of thought he may have been involved somehow,'' said Saretzky as he wiped away tears. "What did he tell you?'' asked Crown prosecutor Photini Papadatou. Papadatou then asked what he thought about what his son had told him. His son was incoherent at times, talking like there was another person beside him who he was arguing with, he added. Larry Saretky told court he encouraged his son to tell officers what he had just told him, which he did. Court has already heard that Blanchette was found dead by his father in his Blairmore home on Sept. 14, 2015. Authorities couldn't find Hailey and issued an Amber Alert that stretched across Western Canada and into the United States. Her body was found in a campground firepit a few days later. Derek Saretzky has pleaded not guilty to the murder charges, as well as to a charge of committing an indignity to the girl's body. The jury saw hundreds of photos earlier in the day from the Blanchette home and at the apartment Derek Saretzky sometimes stayed at. RCMP Cpl. Fred Ridding told the jury that investigators found blood on a child's pillow inside a crib and on the head of a doll in the Blanchette home. Some police photos showed blood stains on pillows inside the master bedroom and bloody drag marks to the bathroom where his body was found. There were also multiple bloody footprints throughout the home. Ridding showed a photo of a hallway where a comforter covered Blanchette's legs which were sticking out of the bathroom. "This is a photograph of how Terry Blanchette's body was found,'' Ridding told the jury. Ridding also testified that there were blood smears found in a van belonging to the dry cleaning company. 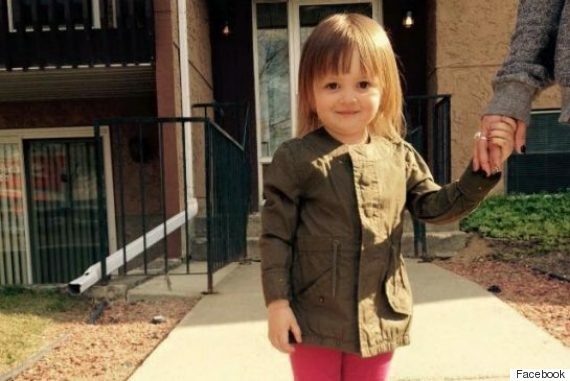 Investigators believe the van, which Saretzky had access to, was used to kidnap and transport the body of the little girl. A search of Derek Saretzky's apartment found human blood on a pair of cowboy boots, on a latex glove, on a piece of rope and on the wall. Police also recovered three box cutters, a hatchet, a crowbar, a pickaxe and a baseball bat. There was also a measuring cup containing human blood and a number of books involving cannibalism, serial killers and cold cases.